The subject matter of this Macro Letter is broad, so I shall confine my investigation to the UK. It was, after all, one of the first countries where services became a larger percentage of GDP than manufacturing. The crossover between manufacturing and services is estimated to have happened around 1881. When Napoleon Bonaparte described England as, ‘A nation of shopkeepers,’ his intension may have been derisive, but his observation was prescient. Of course, M. Bonaparte was actually quoting Adam Smith, who first coined the phrase in his magnum opus, An Inquiry into the Nature and Causes of the Wealth of Nations, published in 1776: now, he really was prescient. …estimated official figures for 2016 highlight that the majority of creative industries sub-sectors are exporting digital services. The IT, software and computer services sector, for example, exports £8.95bn in digital services. However, according to these figures, the crafts and museums, galleries and libraries sectors’ digital services exports are zero – which we know is not the case. Many UK YouTube channels, for example, are watched by millions of viewers across the world. It is through these types of platforms that the creative industries export audiovisual content, music, and tutorials. Such platforms and the content they offer, however, may not be registered as a service export. This is due to difficulties capturing data for business models such as those offering free content and based on advertising revenues. There are also structural challenges with collecting data on such exports. Often, it is difficult for digital intermediaries to determine the point of sale and purchase. The borderless way in which many global firms operate presents additional complications and the origin of the creative content, and of those who consume it, is frequently hard to track. Despite discussion of recession risks I was struck by a cautious optimism about the long-term outlook. There was a general view that the slowdown in productivity growth in the West has been overstated, partly because of problems in capturing gains from technological change and quality improvements. As a result most of us felt that Western economies should be able to improve upon the lacklustre growth rates seen in the last ten years. We agreed too that apocalyptic media stories about new technologies destroying work were overcooked; technology would continue to create more jobs than it destroys. The challenge would be to provide people with the right skills to prosper. The question was, what skills? We had a show of hands on what we would recommend as the ideal degree subjects for an 18-year-old planning for a 40-year career. Two-thirds advocated STEM subjects, so science, technology, engineering and maths. A third, myself included, opted for humanities/liberal arts as a way of honing skills of expression, creativity and thinking. …it does not have to be this way. Some economies, including Singapore, Switzerland and Germany, combine low unemployment and decent productivity growth. The right training and education can raise productivity rates for lower skilled workers. It is claimed that robots, algorithms and artificial intelligence are going to destroy jobs on an unprecedented scale. These developments, unlike past bouts of technical change, threaten rapidly to affect even highly-skilled work and lead to mass unemployment and/or dramatic falls in wages and living standards, while accentuating inequality. As a result, we are threatened with the ‘end of work’, and should introduce radical new policies such as a robot tax and a universal basic income. However the claims being made of massive job loss are based on highly contentious technological assumptions and are contested by economists who point to flaws in the methodology. In any case, ‘technological determinism’ ignores the engineering, economic, social and regulatory barriers to adoption of many theoretically possible innovations. And even successful innovations are likely to take longer to materialise than optimists hope and pessimists fear. Moreover history strongly suggests that jobs destroyed by technical change will be replaced by new jobs complementary to these technologies – or else in unrelated areas as spending power is released by falling prices. Current evidence on new types of job opportunity supports this suggestion. The UK labour market is currently in a healthy state and there is little evidence that technology is having a strongly negative effect on total employment. The problem at the moment may be a shortage of key types of labour rather than a shortage of work. The proposal for a robot tax is ill-judged. Defining what is a robot is next to impossible, and concerns over slow productivity growth anyway suggest we should be investing more in automation rather than less. Even if a workable robot tax could be devised, it would essentially duplicate the effects, and problems, of corporation tax. Universal basic income is a concept with a long history. Despite its appeal, it would be costly to introduce, could have negative effects on work incentives, and would give governments dangerous powers. Politicians already seem tempted to move in the direction of these untested policies. They would be foolish to do so. If technological change were to create major problems in the future, there are less problematic policies available to mitigate its effects – such as reducing taxes on employment income, or substantially deregulating the labour market. ‘I am convinced that the substitution of machinery for human labour is often very injurious to the interests of the class of labourers’. As for Keynes essay on the, ‘Economic Possibilities for our Grandchildren’, his optimism is laudable if laughable – 15 hour working week anyone? Job-grabbing robots are no longer science fiction. In 2013 Carl Benedikt Frey and Michael Osborne of Oxford University used—what else?—a machine-learning algorithm to assess how easily 702 different kinds of job in America could be automated. They concluded that fully 47% could be done by machines “over the next decade or two”. A new working paper by the OECD, a club of mostly rich countries, employs a similar approach, looking at other developed economies. Its technique differs from Mr Frey and Mr Osborne’s study by assessing the automatability of each task within a given job, based on a survey of skills in 2015. Overall, the study finds that 14% of jobs across 32 countries are highly vulnerable, defined as having at least a 70% chance of automation. A further 32% were slightly less imperilled, with a probability between 50% and 70%. At current employment rates, that puts 210m jobs at risk across the 32 countries in the study. For a robust analysis, if not refutation, of the findings of Frey and Osborne, I refer you back to Professor Shackleton’s IEA paper. He is more favourably disposed towards the OECD research, which is less apocalyptic in its conclusions. He goes on to find considered counsel in last year’s report from McKinsey Global Institute (2017) A Future that Works: Automation Employment and Productivity. Notes: April-June of years. Figures in brackets are April-June 2017 levels of employment. The job losses are broadly predictable; that technology has usurped the role of the travel agent is evident to anyone who booked a flight, hotel or hire-car online recently. For economists there are always challenges in capturing the gains; back in 1987 Robert Solow, a recipient of the Nobel prize from economics, famously observed, ‘You can see the computer age everywhere but in the productivity statistics’ – perhaps the technology has been creating more jobs than thought. Does the 170% rise in Animal Care and Control owe a debt to technology? You might be inclined to doubt it but the 400,000 Uber drivers of London probably do. We are still seeking signs in the economic data for something we know instinctively should be evident. We only find mixed results for the impact of industrial robots on wage growth, even after accounting for potential endogeneity and potential offsetting effects across different population or sectoral groups. …We believe that future research on the topic should focus on exploiting more granular data, to explore whether insignificant aggregate effects (on wages) are to the result of counterbalancing developments happening at the firm level. Bruegel refrain from proposing cuts to personal taxation as favoured by the IEA, suggesting that a more complex policy response may be required, however, their conclusions are only marginally negative. I am inclined to hope that market forces may be allowed to deal with the majority of the adjustment; they have worked well if history is any guide. Ignoring the fact that we are nine years into an equity bull market and that interest rates are now rising from their lowest levels ever recorded, the long term potential for technology remains supportive for equity markets, for earnings growth and for productivity. If history repeats, or even if it simply rhymes, it should also be good for employment. With interest rates looking more likely to rise than fall over the next few years, companies will remain reticent to invest in capital projects. Buying back stock and issuing the occasional special dividend will remain the policy du jour. Assuming we do not suffer a repeat of the great financial recession of 2008 – and that remains a distinct possibility – the boon of technology will create employment with one invisible hand as it creatively destroys it with the other (with apologies to Smith and Schumpeter). If governments can keep their budgets in check and resist the temptation to siphon off investment from the productive sectors of the economy (which, sadly, I doubt) then, in the long run, the capital investment required to create the employment opportunities of the future will materialise. Our empirical analysis shows the crisis indeed altered this relationship. During normal times, total factor productivity growth fluctuates over the business cycle along with changes in the intensity with which available labor and capital are used; credit conditions are unimportant. During the crisis, however, distressed credit markets and tighter lending conditions were significant drags on total factor productivity growth. Because productivity’s sensitivity to credit conditions once again diminished after the crisis, the post-crisis easing of credit conditions did not boost productivity growth. 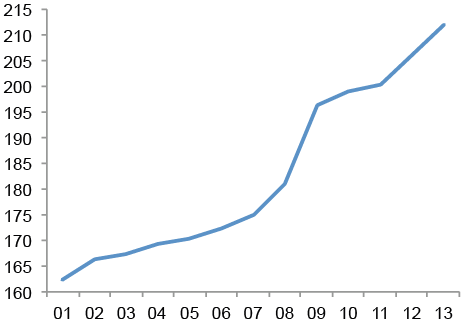 As a result, the financial crisis left productivity, and therefore output, on a lower trajectory. Adverse credit conditions appear to have dampened total factor productivity growth by curtailing productivity-boosting innovation during the crisis rather than by hampering the efficient allocation of the economy’s productive resources through reduced creation and destruction of firms and jobs. Our analysis does not explain the slow pace of productivity growth since the crisis, which has been a source of great concern among economists and policymakers. From 2010 to 2014, TFP growth averaged just 0.6 percent per year, well below its average growth rate of 1 percent from 1970 to 2010. Rather than encouraging businesses to compete by investing in productive assets and trying to take market share, excessive central bank stimulus encourages businesses to buy their competition and consolidate – which typically results in a reduction in the labor force. When the Federal Reserve makes it cheaper to buy your competition than to compete and cheaper to buy back your shares than to invest in new productivity, is it any wonder that productivity drops? This demographic cast iron lid on growth helps explain why the Federal Reserve, ECB, and other central banks seem so powerless. Can they create more workers? Not really. …Buyouts help shareholders but not workers, as they typically entail a consolidation of company workforces and a reduction in the number of “duplicated” workers. While this culling may be good for the individual businesses, it is not so good for the overall economy. It circumvents Joseph Schumpeter’s law of creative destruction. …unless something happens to boost worker productivity dramatically, we’re facing lower world GDP growth for a very long time. Could we act to change that? Yes, but as I look at the political scene today, I wonder where the impetus for change is going to come from, absent a serious crisis. …Given what we did in the last crisis, it is not clear that we still have that capacity. The absolute level of debt is another factor which is impeding economic potential. Whilst credit creation in the private sector has been choked by continuous regulatory tightening of leverage rules for financial institutions, the capital requirements for investing in “risk-free” assets – ie. Bankrolling the state – has remained unchanged. Meanwhile the reduction of official interest rates to below the level of inflation has enabled governments around the world to dramatically expand deficit financing. Contrary to widely held beliefs, the world has not yet begun to delever and the global debt-to-GDP is still growing, breaking new highs. At the same time, in a poisonous combination, world growth and inflation are also lower than previously expected, also – though not only – as a legacy of the past crisis. Deleveraging and slower nominal growth are in many cases interacting in a vicious loop, with the latter making the deleveraging process harder and the former exacerbating the economic slowdown. Moreover, the global capacity to take on debt has been reduced through the combination of slower expansion in real output and lower inflation. Global debt has grown by $57 trillion and no major economy has decreased its debt-to-GDP ratio since 2007. High government debt in advanced economies, mounting household debt, and the rapid rise of China’s debt are areas of potential concern. They go on to highlight three areas of risk:- rise of government debt – which increased by $25trln between 2007 and 2015 – the continued rise in household debt (especially mortgages in Australia, Canada, Denmark, Sweden, the Netherlands, Malaysia, South Korea, and Thailand ) and the quadrupling of China’s debt to $28trln or 282% of GDP. China has been attempting its own brand of regulatory tightening of late alongside the great rebalancing towards consumption, but even official measures of GDP suggest that the economy has stalled and stimulus has resumed during the last few months. Global real-estate continues to benefit from the low interest rate environment, although planning restrictions in many prime locations is the principle driver of price appreciation, notwithstanding Chinese anti-corruption measures which have tempered demand recently. The rise in government debt continues to crowd out the opportunities for private sector investment, whilst central bank quantitative easing (QE) programmes act as a natural buyer of these securities. The BIS Working Papers No 559 A comparative analysis of developments in central bank balance sheet composition – provides an insight into the changing structure of the balance sheets of a variety of central banks. For a snapshot of the quantum, Yardeni Research – Global Economic Briefing: Central Bank Balance Sheets published on Monday, is more instructive. At end April Fed, ECB, BoJ and PBoC had a combined record total of $16.7trln, up from around $9trln at the beginning of 2010. The ECB and the BoJ have been the main drivers of growth this year, whilst the Fed and the PBoC balance sheets have marked time. Using the case of the US economy, Crotty argues that financialization has had a profound and largely negative impact on the operations of US nonfinancial corporations. This is partly reflected in the increasing incomes extracted by financial markets from these corporations. …the payments US NFCs paid out to financial markets more than doubled as a share of their cash flow between the 1960s and the 1970s, on one hand, and the 1980s and 1990s on the other. As NFCs came under increasing pressure to make payments, they also came under increasing pressure to increase the value of their stock prices. …Financial markets’ demands for more income and more rapidly growing stock prices occurred at the same time as stagnant economic growth and increased product market competition made it increasingly difficult to earn profits. The authors conclude that the solution is redistributive taxation, I would counter that a better solution would be to reduce the tax and regulatory privileges associated with government debt, thus freeing the private sector from the yoke of unfair public sector competition. But this is a polemic for another time and place. What is clear is that the availability of credit and leverage amplifies business cycles in both directions. Increasing debt and leverage for an economy with a diminishing working age population is not sustainable. Without the demographic windfall of immigration or procreation, increasing productivity is the only way to sustain real economic growth. The short term financial wizardry of the share buy-back is a function of the artificially low price of credit. The longer central bank sponsored largesse continues, the lower the trend rate of GDP growth will become. A combination of fiscal reform and gradual normalisation of monetary policy could redress the situation but I believe it is politically unachievable. Markets climb a wall of fear, even at these exalted levels, it still makes sense to be long bonds, stocks and real-estate but, once the limit of government intervention has been reached, the “levee gonna break”. Technology Indices and Creative Destruction – When Might the Bubble Burst? I adhere to the belief that technology and other such improvements in manufacturing are the key to delivering productivity growth, which thereby improves the quality of life for the greatest number. Of course, as Joseph Schumpeter so incisively illustrated, the process is often cathartic. For the technology investor this increases both the risk and potential reward. As of 2013, the nation’s 50 advanced industries employed 12.3 million U.S. workers. That amounts to about 9 percent of total U.S. employment. And yet, even with this modest employment base, U.S. advanced industries produce $2.7 trillion in value added annually—17 percent of all U.S. gross domestic product (GDP). That is more than any other sector, including healthcare, finance, or real estate. At the same time, the sector employs 80 percent of the nation’s engineers; performs 90 percent of private-sector R&D; generates approximately 85 percent of all U.S. patents; and accounts for 60 percent of U.S. exports. 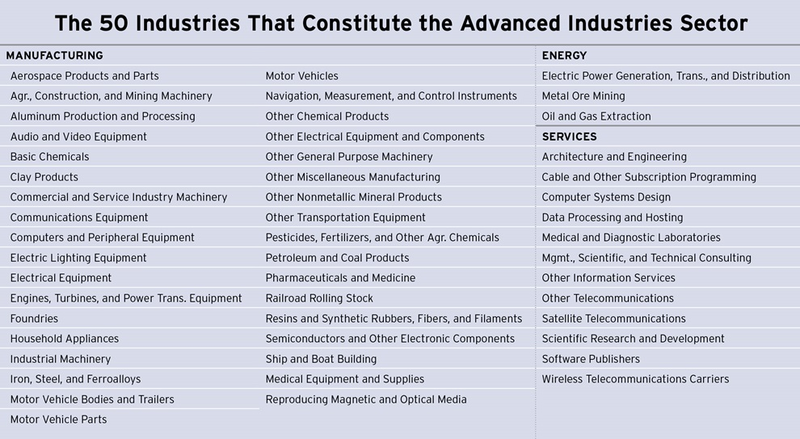 Advanced industries also support unusually extensive supply chains and other forms of ancillary economic activity. On a per worker basis, advanced industries purchase $236,000 in goods and services from other businesses annually, compared with $67,000 in purchasing by other industries. This spending sustains and creates more jobs. In fact, 2.2 jobs are created domestically for every new advanced industry job—0.8 locally and 1.4 outside of the region. This means that in addition to the 12.3 million workers employed by advanced industries, another 27.1 million U.S. workers owe their jobs to economic activity supported by advanced industries. Directly and indirectly, then, the sector supports almost 39 million jobs—nearly one-fourth of all U.S. employment. …From 1980 to 2013 advanced industries expanded at a rate of 5.4 percent annually—30 percent faster than the economy as a whole. …Workers in advanced industries are extraordinarily productive and generate some $210,000 in annual value added per worker compared with $101,000, on average, outside advanced industries. Because of this, advanced industries compensate their workers handsomely and, in contrast to the rest of the economy, wages are rising sharply. In 2013, the average advanced industries worker earned $90,000 in total compensation, nearly twice as much as the average worker outside of the sector. Over time, absolute earnings in advanced industries grew by 63 percent from 1975 to 2013, after adjusting for inflation. This compares with 17 percent gains outside the sector. Even workers with lower levels of education can earn salaries in advanced industries that far exceed their peers in other industries. In this regard, the sector is in fact accessible: More than half of the sector’s workers possess less than a bachelor’s degree. The report is not an unalloyed paean of praise, however, they go on to emphasise the need for better education and training in order to maintain momentum. In December 15 years ago the dotcom crash was a few weeks away. Veterans of that fiasco may notice some familiar warning signs this festive season. Bankers and lawyers are being priced out of office space in downtown San Francisco; all of the space in eight tower blocks being built has been taken by technology firms. In 2013 around a fifth of graduates from America’s leading MBA schools joined tech firms, almost double the share that struck Faustian pacts with investment banks. Janet Yellen, the head of the Federal Reserve, has warned that social-media firms are overvalued—and has been largely ignored, just as her predecessor Alan Greenspan was when he urged caution in 1999. Good corporate governance is, once again, for wimps. Shares in Alibaba, a Chinese internet giant that listed in New York in September using a Byzantine legal structure, have risen by 58%. Executives at startups, such as Uber, a taxi-hailing service, exhibit a mighty hubris. …Instead, today’s financial excess is hidden partly out of sight in two areas: inside big tech firms such as Amazon and Google, which are spending epic sums on warehouses, offices, people, machinery and buying other firms; and on the booming private markets where venture capital (VC) outfits and others trade stakes in young technology firms. 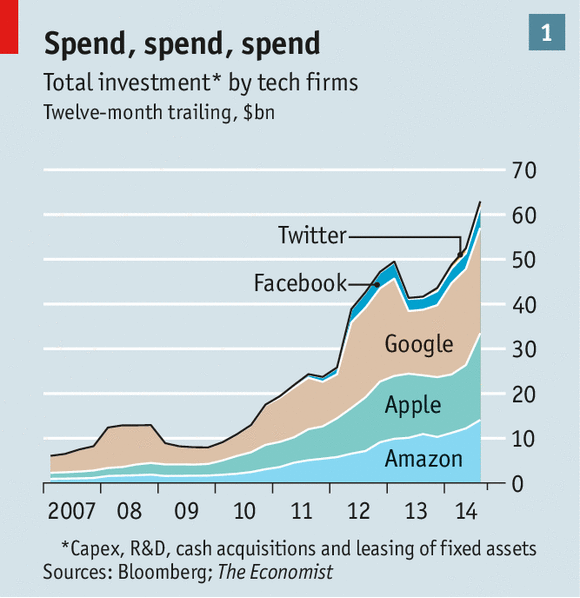 Take the spending boom by the big, listed tech firms first. It is exemplified by Facebook, which said in October that its operating costs would rise in 2015 by 55-75%, far ahead of its expected sales growth. Forget lean outfits run by skinny entrepreneurs: Silicon Valley’s icons are now among the world’s biggest, flabbiest investors. Together, Apple, Amazon, Facebook, Google and Twitter invested $66 billion in the past 12 months. This figure includes capital spending, research and development, fixed assets acquired with leases and cash used for acquisitions (see chart 1). That is eight times what they invested in 2009. It is double the amount invested by the VC industry. If you exclude Apple, investments ate up most of the cashflow the firms generated. Together these five tech firms now invest more than any single company in the world: more than such energy Leviathans as Gazprom, PetroChina and Exxon, which each invest about $40 billion-50 billion a year. The five firms together own $60 billion of property and equipment, almost as much as General Electric. They employ just over 300,000 people. Google says it is determined to keep “investing ahead of the curve”. …The second area of technology froth is in private markets. Their exuberance was demonstrated on December 4th when Uber closed a $1.2 billion private funding round that valued the five-year old firm at $40 billion. Baidu, China’s biggest search engine, is set to buy a stake, too (see page 101). There are 48 American VC-backed firms worth $1 billion or more, compared with ten at the height of the dotcom bubble, according to VentureSource, a research outfit. In October a software firm called Slack was valued at $1.1 billion, a year after being founded. 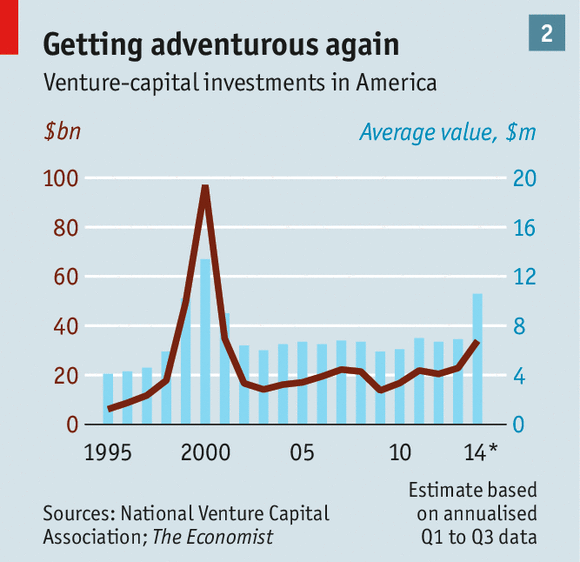 2014 looks set to be the biggest year for VC investments since 2000 (see chart 2). The adoption of biotech subsidies raises the number of star scientists in a state by 15% relative to that state’s pre-adoption number of stars. We find a similar effect from the adoption of R&D credits. These findings are important because of the role star scientists play on the local development and survival of U.S. biotech clusters. In addition, we find that most of the increase in the number of stars is due to their relocation to states that adopt incentives. Meanwhile, subsidies have only a limited effect on the productivity, measured by patenting, of incumbent scientists already in the state. We also find that the increase in star scientists happening after a state adopts a biotech incentive is entirely due to an increase in private/for-profit sector scientists, with no detectable increase in academic scientists. We found that, after states adopted incentives, they experienced significant increases in the number of star scientists, the total number of biotech workers, and the number of establishments, but limited effects on salaries and patents. We also uncovered significant spillover effects from biotech incentives to employment in other sectors that provide services in the local economy such as retail and construction. In terms of policy implications, it is important to keep in mind that our finding that biotech subsidies are successful at attracting star scientists and at raising local biotech employment do not necessarily imply that the subsidies are economically justified. The economic benefits to a state of providing these incentives must be weighed against their fiscal costs—for instance, the loss of tax revenues and resulting loss of public services. Our research suggests that state incentives are successful at increasing the number of jobs inside the state. Nevertheless, our results do not suggest that the social benefit—either for that state or for the nation as a whole—is larger than the cost to taxpayers, nor that incentives for innovation are the most effective way to increase jobs in a state. Yet we find ourselves in a world increasingly afflicted with myopia-governments that can’t see beyond the next election, an education system that can’t see beyond the next round of standardized tests, and public financial markets that can’t see beyond the next trade. This was what Dell faced as a public company. Shareholders increasingly demanded short-term results to drive returns; innovation and investment too often suffered as a result. Shareholder and customer interests decoupled. My personal preference is for a free-market approach, despite the risk of underinvestment in the most capital intensive areas of research. The valuation of growth stocks has always been fraught with uncertainty, especially when future cashflows are often deferred by several years and earnings forecasts, subject to significant variance. An even greater difficulty, as the chart above makes clear, is to assess, and hopefully anticipate, the herd behaviour of technology investors. The European dalliance with technology investment was shorter lived than in the US. So was the violence of the subsequent bust. The market had still not cleared by 2008 and achieved new lows for the decade. The subsequent recovery has been muted. The IXN appears to be roughly halfway between the two extremes. US investor perception of technology seems to be substantially rosier than that of the European investor. Looks can be deceptive. This move has been broader based than simply the European technology sector. 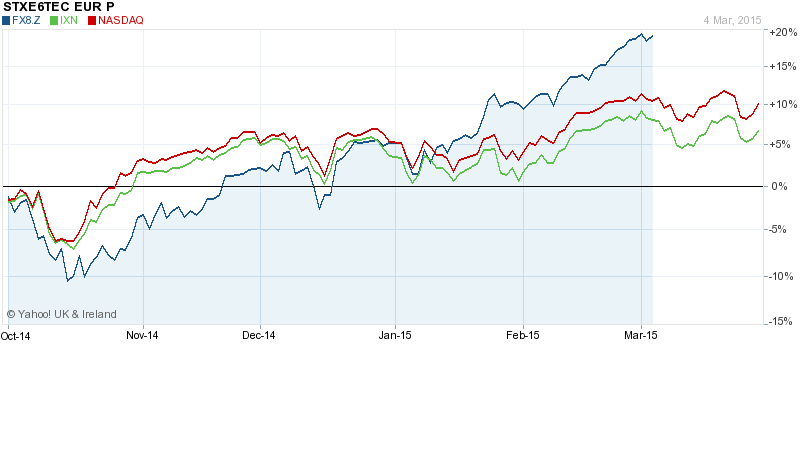 Led by Germany, most Eurozone stock markets have traded higher. This has largely coincided with the QE actions of the ECB and the steady weakening in the value of the Euro that this policy has abetted. The Euro Effective Exchange Rate has fallen from 100 to 90 over the same period. In terms of skills uniquely identified in movers, Math, Science, Technology and Engineering seem to play a particularly important role. In terms of industries, movers are found to work mostly in media and entertainment; professional services; oil and energy; government, education and non-profit but most importantly, technology-software. …Five out of ten cities attracting people with tech skills (especially IT infrastructure and system managements; Java development and web programming) are located in India, including the first four of the list. San Francisco only comes fifth, followed by two other US cities and two Australian. No European city at all makes it to the list. For the 52 cities looked at in the study, the median percentage of new residents with tech skills was 16%, or just under 1 in 6; in many of the Indian cities, its more than double that figure. European cities are the real laggards: the percentage of new residents with tech skills was 18% in Berlin, 15% in Paris, 13% in Madrid and 11% in Paris. But there may be more to that.. Research by Vivek Wadhwa (Stanford) revealed that half of Silicon Valley start-ups were launched by immigrants, many of them educated in US top universities. But he also noticed that “for the first time, immigrants have better opportunities outside the U.S.” because, among other things, of rather strict immigration laws and California’s steep cost of living. Bahl himself, who studied in the US and spent some time working at Microsoft, reportedly wanted to initiate his company in the US but eventually went back to India because of visa problems. And this is also why the tech industry – at the (by now almost) desperate search for engineers – is supporting the introduction of specific “start-up visa” for high-skilled workers in the US. The insights provided by this data is particularly important in the context of the recent discussions on the US immigration reform, but it is not without implications for Europe, which is at the bottom of the ranking as far as attracting tech talent is concerned. This chart benchmarks the median quality of scientists leaving or moving (for the first time) to a country between 1996-2011. The size of the bubble corresponds to total flows (inflows plus outflows). Countries in red are net contributors to the international market for scientists, those in blue net recipients. Ideally, a country should want to be below or on the 45-degree line, indicating that the quality of the newcomers is just as high (or higher) as that of the leavers. Conditional on this, a country should also prefer a larger rather than smaller bubble, representing a sizeable flow of scientists and indicating a full exploitation of synergies gained from international cooperation. Finally, countries should aim to land in the top-right quadrant, indicating higher quality of both incoming and outgoing researchers. Over the long-term (pre-crisis) period analysed, Spain and the UK seemed the best placed at attracting high-quality scientists. 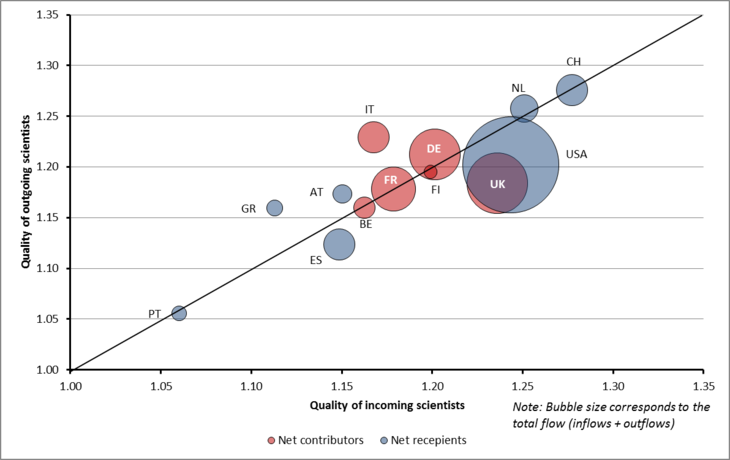 France and Germany were broadly breaking even in terms of quality, although we note that they were facing significant net outflows of scientists, as was the UK. All in all, in the sample here presented, while the US (unsurprisingly) comes out as the top performer in terms of net inflow of quality researchers, Italy ranks quite poorly. Not only the country is a net contributor of scientists, it also trades high quality researchers for lower quality ones. Time for a reform of the university system? Second, is to consolidate fundamental research as the flagship for Europe. As the essential foundation for a knowledge-based society. Working towards a single, open market for knowledge though open science. Third: implement Horizon 2020 and the new Investment Plan to leverage the Europe economy towards a higher plane as a research and innovation-based area. Working towards a single, open market for knowledge though open science. It is better to focus on our potential than to dwell on illusions. We will always be different from other parts of the world. But that difference has many benefits! These are stirring words, but in the EU turning words into deeds takes time. In unfettered, free-markets, resources are allocated more efficiently. Nonetheless, hope remains. It shows how clusters of powerful technologies increase productivity and move mainstream for about 22.5 years, like what we saw from 1988 into 2010. Now we’re in the doldrums of this cycle and won’t move into the next upward swing again until after 2032. In short, the productivity revolution is over for the next two decades or so. That means less earnings and wage gains, regardless of demographic trends. Interestingly, Dent then go on to wax lyrical about the potential for Bio-tech. In technology even the bears tend to be bullish about something. … The paper suggests that it is useful to think of the innovative process as a series of discrete inventions followed by incremental improvements which ultimately tap the full potential of the initial invention. For the first two industrial revolutions, the incremental follow-up process lasted at least 100 years. For the more recent IR3, the follow-up process was much faster. Taking the inventions and their follow up improvements together, many of these processes could happen only once. Notable examples are speed of travel, temperature of interior space, and urbanisation itself. The benefits of ongoing innovation on the standard of living will not stop and will continue, albeit at a slower pace than in the past. But future growth will be held back from the potential fruits of innovation by six “headwinds” buffeting the US economy, some of which are shared in common with other countries and others are uniquely American. Future growth in real GDP per capita will be slower than in any extended period since the late 19th century, and growth in real consumption per capita for the bottom 99% of the income distribution will be even slower than that. These are important impediments to growth but I believe not all of them are as clear cut as Gordon suggests. Firstly, the demographic dividend may be in decline but technology has made it easier for people to work until much later in life. Added to which, a more flexible labour market encourages greater participation. I wonder whether the decline in labour force participation is to some extent due to the improvement in welfare provision and not just a deficit of permanent “quality” jobs? The modern digital revolution—with its hallmarks of computer power, connectivity and data ubiquity—has brought iPhones and the internet, not crowded tenements and cholera. But, as our special report explains, it is disrupting and dividing the world of work on a scale not seen for more than a century. Vast wealth is being created without many workers; and for all but an elite few, work no longer guarantees a rising income. Income inequality is a popular economic theme and Gordon pays tribute to Emmanuel Saez – though not Thomas Piketty who has become its popular champion. From my interpretation of Piketty’s book, I believe that income inequality is a natural outcome of the long term benefits of peace. Reducing government intervention in the functioning of free markets is a better solution to this structural problem. Smaller government will not remove inequality but it will increase economic mobility, and, in the process, create faster economic prosperity – thereby more rapidly improving the standard of living for the greatest number of people. In freer markets, the technology entrepreneur, and creative risk takers in general, have a greater incentive to embrace opportunities. Outsourcing is not new, David Riccardo observed its effects long ago. As rich countries adapt to concentrate on their comparative advantages – hopefully undistorted by government subsidy and protective tariff – the short-term headwind of lost domestic labour will be offset by the lower cost to the consumer of outsourced services. A greater proportion of a consumer’s income will then become available for investment. Once the investment has been allocated, the increased pool of available labour can then be retrained for employment in more productive enterprises. Frederic Bastiat – That Which is Seen and That Which is Not Seen makes this point much more eloquently than I could hope to do. At the global level, man’s capacity to pollute his environment has not diminished but developing countries are less able to afford the luxury of conscience. Our best hope is technology. Yet technological discovery occurs by evolutionary leaps rather than steady increment. The lag between discovery and commercial application can also be long and variable. The collapse in the price of photovoltaic cells, making solar power dramatically more viable as an alternative to fossil fuel, is but one example. The tantalising potential of the development of tidal energy generation is another – especially given man’s predilection to inhabit the margins of the sea. Carbon sequestration technology – at present uneconomic – might be the next technological “leap”. I remain an optimist about man’s ingenuity. Since the Economist first published its Commodity Index in 1864 the price of commodities has been falling by roughly 1% per annum in inflation adjusted terms – punctuated by sharp price increases normally associated with war. Peace leads to investment and, as new technologies are adopted, prices begin to march lower once more. And borrowing sure as hell beats husbandry. In such a context, and with still very high leverage, allowing the real rate to rise above its natural level would risk killing the recovery. Beyond pushing the economy into a prolonged period of stagnation, this would also put at risk the deleveraging process which is already very challenging. Although there is a lot of uncertainty about such predictions, our call is for caution on interest rate rises. The case for caution in pre-emptively raising interest rates is reinforced by the weakness of inflationary pressures. …The policy requirements for successful exit from a leverage trap are much broader than the appropriate conduct of monetary policy. The report addresses the fiscal challenges, the scope for macro-prudential policies and the restructuring of private-sector (bank, household, corporate) debt and sovereign debt. The report also argues that – given the risks and costs associated with excessive leverage – more needs to be done to improve the resilience of macro-financial frameworks to debt shocks and to discourage excessive debt accumulation. Finally, we advocate enhanced international policy cooperation in addressing excessive global leverage. Well, here’s another nice mess you’ve gotten me into. With all markets, I begin my analysis with technical patterns. This is a form of self-preservation; to paraphrase Keynes, I may be right in my fundamental analysis but the market is never wrong. On this basis I see no compelling reason to exit the technology sector, although there is a case to be made for rotation out of the Nasdaq and into technology stocks in Europe. I make the caveat, however, that European stocks have inherently less liquidity than US stocks and are therefore likely to exhibit greater volatility, especially on the downside. Several of the names have changed, added to which, many of today’s valuations, as measured by P/E ratios, are far less demanding – although Amazon (AMZN) at more than 700 times earnings, remains a notable exception. Looked at from another perspective, the technology promise of 2000 has delivered – today’s top tech companies are delivering real earnings. To understand whether the undemanding multiples are a harbinger of a period of “ex-growth” to come or represent an undervalued opportunity, we need to examine each individual stock in detail. This is beyond the macroeconomic analysis of this report, but one “macro” factor worth considering is the question of debt versus equity finance. At the risk of making a sweeping generalisation, technology companies are more likely to finance their projects via equity than debt – although established, large cap, technology companies make ample use of the capital markets. Technology projects often require long-lead times to deliver positive cashflows and the value created is invariably intellectual rather than physical. An Oil company with proven reserves may have to wrestle with the volatility in the price of crude oil, but it can mortgage those “reserves” – they have a fairly predictable future demand. Technology companies must endure the vicissitudes of disruptive innovation. Todays “must have” products can rapidly become tomorrow’s museum “curiosities”. To this extent, technology firms are better placed to weather a cycle of increasing interest rates because they carry less debt. Here lies a dilemma. In the absence of the interest rate on debt to signal the riskiness of an investment, the availability of equity finance becomes critical. As the IPO market has become more active, venture capitalists have been pouring money into earlier and earlier investment opportunities to avoid having to pay too high a price for private equity – I’ve heard the phase “pre,pre-seed” which smacks of a lack of discrimination. Access to equity investment should be a signal about the validity of a project – in the current “overinvestment” environment, the informational value of this “signal” is dramatically diminishing. 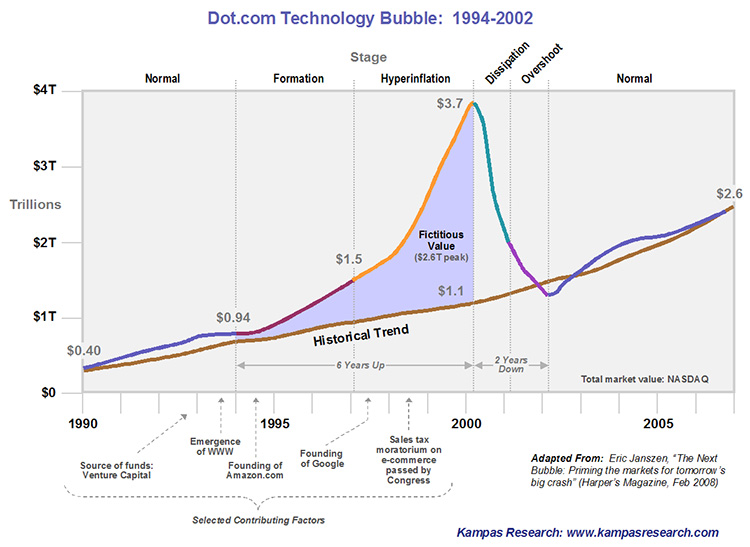 The current technology boom is very different from the dotcom bubble of 2000. The top companies in the sector have real earnings and trade at less demanding PE multiples. There are still early stage companies which have no cashflows but these are the much less prevalent today. At the risk of stating the obvious, look for companies with low debt to equity ratios, since these will weather the storm of rising interest rates more comfortably. Look for companies with growing earnings and, where possible, growing dividends. Keep a close watch on the price trend of the stock and have a stop-loss level in mind at which you will exit to preserve capital, regardless of your own opinions. Set a price target if you wish but remember that markets are prone to irrationality – I tend to let the “trend be my friend”. For the present, technology stocks look set to continue rising, but it is important to remember that the correlation between equity indices tend to be high – The Nasdaq and the S&P500 have a one month correlation of more than 90%. Interest Rates may stay low for a protracted period, but the risk is asymmetric – not far to fall, a long way to rise – and conventional wisdom, which advocates investment in stocks because they are negatively correlated to bonds, may be severely tested as central bank interest rates normalise globally. For more on this topic the November 2013 paper from Pimco – The Stock-Bond Correlation is well worth investigation. 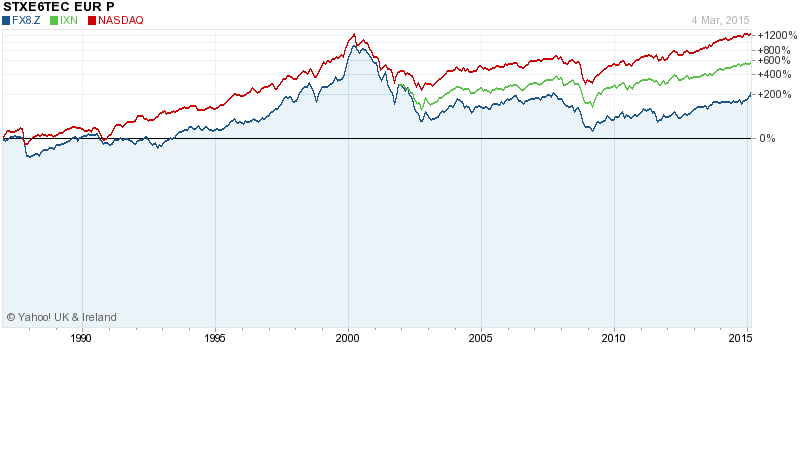 A final caveat concerning technology stocks. Most of the constituents of tech indices are growth stocks and therefore tend to have higher betas than the underlying index. This is a simple measure of their volatility – replete with Gaussian assumptions of “normality”. When constructing your investment strategy, keep the absolute level of volatility in mind, albeit is a measure of variance rather than risk. If this is a technology bubble, make allowance for it and you will weather its tempests, underestimate it and you will be forced to capitulate; the bull market isn’t over yet and the broader market will determine the timing of its demise.